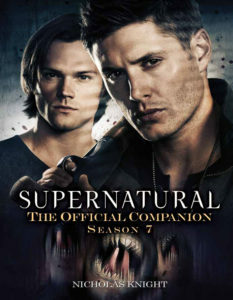 Supernatural: The Official Companion Season 7 by Nicholas Knight is a great guide to the seventh season, filled with fascinating behind-the-scenes insights and fun extras. Now, I’m going to be honest with you, season seven wasn’t my favorite, but it did introduce us to some pretty cool things. We got Dean going back in time to the forties where he hung out with Elliot Ness, Felicia Day played the geeky tech Charlie Bradbury, and it introduced us to Prophet Kevin Tran, fandom’s new favorite character. Season seven also took some risks, taking away some of the things the boys always depended on, from the Impala, to pie, to the ultimate sacrifice of Bobby. The season expanded the mythology of the long-running series, opening even more story possibilities with the introduction of the new villains, the Leviathans. I might not have been too thrilled with the direction certain things went (Bobby, no! ), or how the Leviathans developed into something more laughable than frightening, but season seven tried to bring new life to the series by changing things up a bit. Change is one of those risky things in television. Fans always say they don’t want the same thing over and over again, but then when you start doing different things they complain. Hey, I’ve done it; change is scary, but it’s also something necessary, especially in a long-running series like this. I can appreciate season seven for the risks it took; plus, it is still Supernatural, so it gave me the Winchester fix I needed. And after reading The Official Companion, I appreciate it even more, seeing what it takes to make an episode all the way through. After that, the Companion goes into the episode guides that make up most of the book. The episode guides all start with a summary of the episode, which is a good refresher for someone who, say, has to write about the show regularly, but hasn’t had a chance to re-watch the season. I imagine most fans, however, will have that part memorized before they even crack open the spine, but there’s plenty more in this book than just rehashed episode plots. Each episode also has behind-the-scenes interviews with the writers, directors, actors, and all sorts of other people from the set. One of my favorite parts is the look at how certain things were designed, like how the courtroom set in “Defending Your Life,” where the god Osiris put Dean on trial, was originally written as a modern American courtroom stuffed into a barn. But then the director and production designer decided it would make more sense for an Egyptian god to have things look maybe a little Egyptian, which is why the barn courtroom had impressive statues and braziers instead of looking like something out of L.A. Law. The best part, though, is that locations manager Russ Hamilton kept the set decorations and used them to decorate his house for Halloween. That had to have been the coolest house ever! At the end of the book there are profiles on all of the major characters from the season, featuring interviews with the actors who portray them giving their thoughts on how they developed this season, and any interesting factoids they wanted to share, so that’s awesome, as Dean might say. There are also a couple profiles on some crew members, plus two kind of random but fun sections where, in one, cast and crew reveal if they believe in the supernatural and, in the other, they share their greatest fear, like in “Plucky Pennywhistle’s.” The book ends on two pages discussing the reaction that the show received for season seven, but that part was basically just a summary of the awards they won and all of the book tie-ins that were published or are due to be released soon. That last section wasn’t that interesting, but if you’re looking for the latest Supernatural novels, then I guess it at least would be informative. I’d say this book is definitely worth a read. Supernatural: The Official Companion Season 7 is filled with fun extras and interviews and is a great addition to any Supernatural fan’s collection. If you love seeing behind the scenes of your favorite show, you’ll love this book. It’s also a handy guide for anyone who wants to review the major points of the season, so if you’re writing your fan fiction and need to look up which episode Garth was first introduced, you can flip through this and find out. It’s also just a fun look into the production of the show, and it may make you want to run away to Vancouver just to join the crew.